If you have ever enjoyed a gorgeous curry, you know the amazing flavor and color of Turmeric. For years, the spice has been used to provide relief from a number of ailments and as a preventative measure for others. From detoxing the liver and warding off depression, to aiding in memory and cure ringworm (yes, really) Turmeric is kind of the Baking Soda of spices. 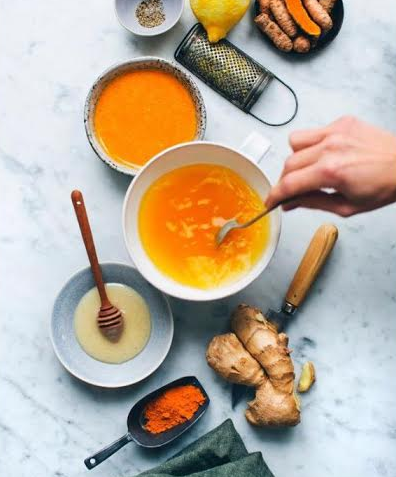 A significant (and non-toxic) anti-inflammatory.The orange pigment of turmeric is called curcumin, a powerful anti-inflammatory that has shown results comparable to hydrocortisone and phenylbutazone and Motrin. An effective treatment for Inflammatory bowel disease (IBD). Research has shown that Curcumin is a well-tolerated and effective treatment for those who suffer from Crohn’s and ulcerative colitis. A powerful antioxidant. Curcumin is able to neutralize free radicals and chemicals which can damage to healthy cells. This is particularly helpful for those who suffer from joint diseases such as rheumatoid arthritis as the herb is known to shorten the duration of morning stiffness and reduce joint swelling nearly as well as pharmaceutical drugs. A strong defense against cancer cell growth. Research by Epidemiologists have shown that frequent intake of turmeric leads to lower rates of a number of cancers ( prostate, Colon, lung and breast). A quick heartburn fix. Because of it’s anti-inflammatory properties, Turmeric is a reliable defense against heartburn and indigestion. Photo: Amazing soup from Green Kitchen Stories.